I have a recipe which says to use a “jelly roll” pan. Can you please tell me what size exactly a jelly roll pan is? I have a baking sheet that is 17 1/2″ x 12 1/2″ x 1″ deep. I actually have always used it for cookies. Is this a jelly roll pan? We are trying to make a blueberry coffee cake and it says to use a jelly roll pan. We see pictures, but how deep is it? They say it is a cookie sheet with sides. Can you help us? 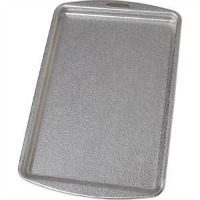 Jelly Roll Pan – A wide, flat pan similar to a cookie sheet or baking sheet with sides. The sides are 1-inch (2.54 cm) deep. The most all-purpose size to have is a 12 x 17 by 1-inch Jelly Roll Pan. These pans were intended for baking the sheet cake or sponge cake used in making jelly rolls. Jelly roll pans are handy for many other uses such as for roasting vegetables and baking cookies. Jelly roll pans are supposed to be smaller than half sheet pans. Your pan is a half sheet pan, so your layers might come out too thin or overcooked in it. Jelly roll pans are 10.5 x15.5″. To make things complicated, now that people make fewer roll cakes, terms are looser and some people refer to any baking pan with a low rolled edge all around as a jelly roll pan.